Homemade Crepes – Learn how to make crepes from scratch! Serve these with your favorite fruit preserves, Nutella, or simply dust them with powdered sugar! This truly is my favorite dessert ever! As a child my mom used to make this for us almost every weekend. She taught us from a very early age how to make these. So I’ve really been making these for as long as I can remember. There’s absolutely no need to be scared of making them! They really are easy to make, and the best part is that you can fill them with anything you like. To this day I still make these at least once a week. A crepe is a type of a very thin pancake. Crepes are very popular throughout Europe, especially France. They can be made either savory or sweet. My favorite filling is nutella, or just any plain old jam, raspberry, strawberry, blueberry, apricot, whatever you have in your fridge. 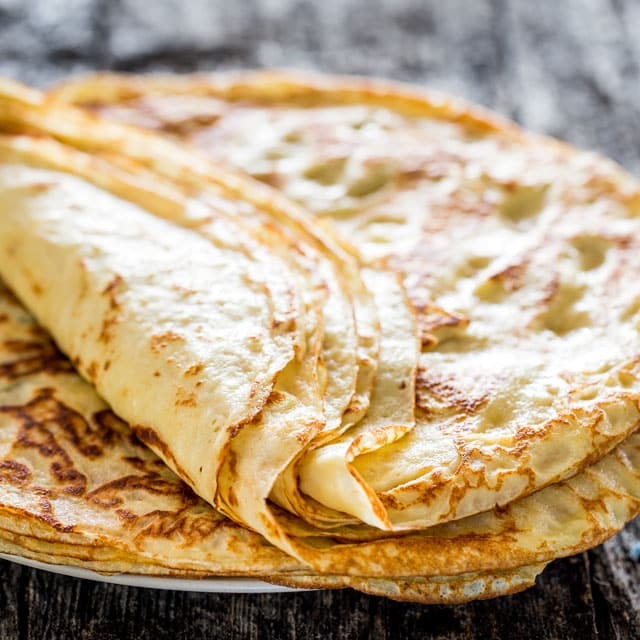 Another way these crepes are served, is with a cheese filling inside usually made from ricotta, eggs, sugar, sour cream and raisins and folded into squares then baked for a few minutes. For today I’m sticking with the awesome Saskatoon blueberry jam. But stick around for the next post, and you’ll see what I’m talking about with my new favorite maple ricotta crepes, which really is my version of a Canadian/Romanian crepe. 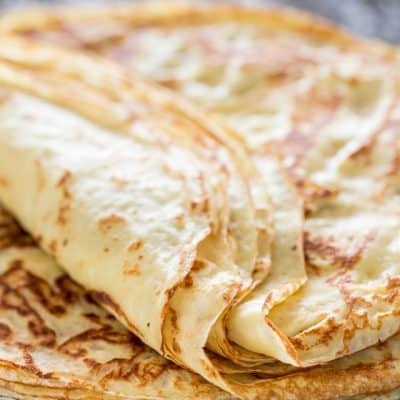 But these crepes are also very versatile, they could even be made savory and filled with chicken, or mushrooms or anything you can imagine. No matter which way you make them, they are simply delicious. I think most people are probably afraid of making the batter, which to be honest I’ve always made it with no recipe. Since we were little my mom had ingrained the ingredients that go into making the batter into our heads; flour, sugar, eggs, milk. Those are the main ingredients, then of course you can throw in a bit of vanilla extract, some salt to enhance the flavors and sometimes even a bit of butter. And as far as consistency, all you really have to remember is that it needs to have the consistency of heavy cream, completely different from the American pancakes where you have a nice thick batter, the crepe batter consistency is quite thin. To actually make these you could use a crepe pan. To tell you the truth, I’ve only recently started using a crepe pan because my hubby bought me one. Up until now bI’ve just been using a regular frying pan. My pan is 11 inches which makes for pretty big crepes, but even an 8 inch frying pan would work just as well. The only thing you have to take into consideration is how much batter to add to the pan based on your pan size. For my 11 inch pan I add a full ladle of the batter, and for a smaller pan you need just a bit less. This is something you’ll have to play around with and figure out on your own. After making each crepe you can add a bit more butter to the pan, but I find it easier to just spray my pan with some cooking spray instead. 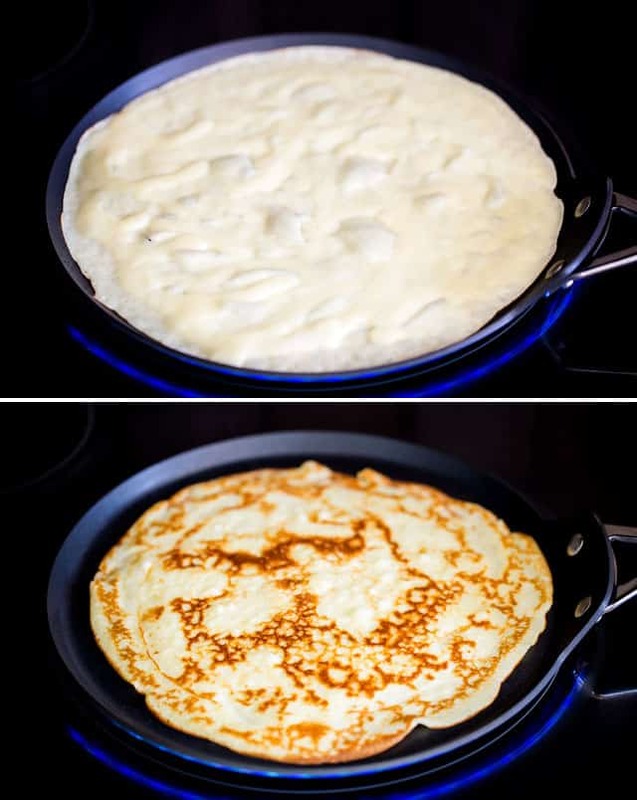 After you add a ladle of the crepe batter to the pan you have to quickly rotate the pan around to spread the batter evenly over the entire surface of the pan. Trust me it will get easier as you do this more and more. The crepe is done on the first side when you see the edges starting to brown a bit, and the crepe should easily slide around in the pan, at which point you can easily flip it over and cook for another minute or so. Once done with all your crepes, you can finally enjoy the fruits of your labor and trust me you will enjoy these. My mom never used a blender, she actually always used a mixer. However, I’ve found that a blender is much better to get that perfect consistency for crepe batter. You can also use a whisk and whisk it all by hand, but if you have a blender, use it. When making the crepe batter, remember that this is a thin batter, it should have the consistency of heavy cream. When you spread it in the pan, it should spread easily. If you find it’s too thick and it isn’t spreading, add a few more tablespoons of water to thin it out. Always let your batter rest for a few minutes in order to produce light and delicate crepes. I usually wait about half hour before starting to make them. If you plan ahead, you can even refrigerate it overnight. If at first you don’t succeed, try ty again. This is so true when it comes to making crepes! Practice really is key. The best way to learn how to make crepes is to make them. The first crepe is always the hardest, so don’t give up if your first one breaks. By the time you use up all the batter, you will have it mastered. 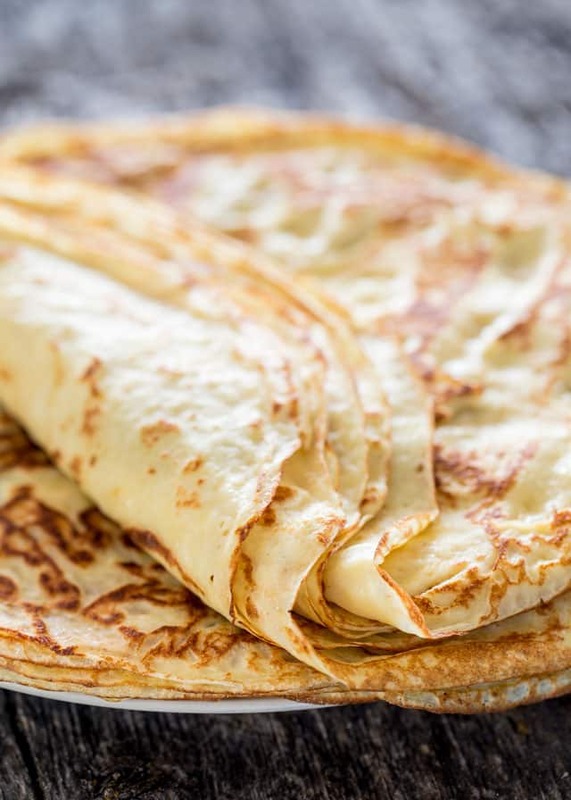 The next thing you’ll know is you’ll be flipping crepes like a pro. Homemade Crepes - Learn how to make crepes from scratch! Serve these with your favorite fruit preserves, nutella, or simply dust them with powdered sugar! Mix all the ingredients in a mixer or a blender really well and let sit for a few minutes. In the meantime heat a non stick frying pan with a 1/2 tsp of oil really well or spray is generously with cooking spray. It is very important that the pan is very hot. Pour 3/4 of a ladle of the crepe mixture, or more depending on your pan size, into the pan and spread the mixture to cover the entire pan, by rotating the pan. Leave about 1 to 2 min per side then flip over or until you see the edges of the crepe starting to brown a little bit. Once the crepe is done on one side it will also be able to slide it around and flip it over. Repeat steps until you've prepared all the crepes. When you're done use your favorite jam and spread about a tsp of jam per crepe, then roll the crepe and enjoy! This recipe will yield approximately 8 crepes. I also make these quite often with lactose free milk, and they turn out just as great. 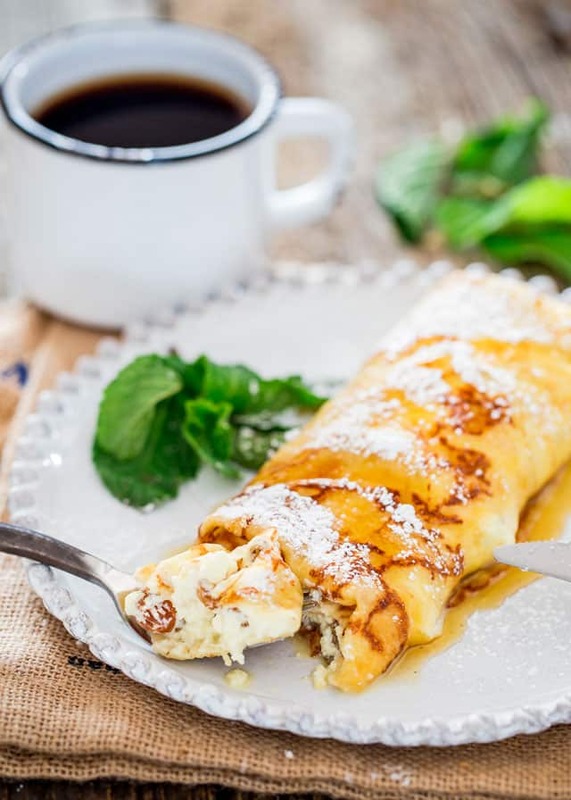 Try these Maple Ricotta Stuffed Crepes! You can fill these with nutella, jams, preserves, ricotta, etc. Hi, Jo, have you ever been to the Pfanntastic Pannenkoek Haus off Crowchild Trail (on 54 Ave SW)? I’d love to make a savoury crepe – do you have a recipe for one? I particularly like their potato, onion, bacon and cheese one (their most popular). I think you just fry up the potato, onion and bacon first, then pour the crepe batter over it, then flip and THEN add the cheese? I’m not sure. I’ve never made crepes before but this recipe looks manageable! We were just talking about this place not too long ago. Never been but I’m dying to go! I’ve never made one with potato, but the crepe batter should be the same, without the sugar. If you do give it a try let me know how it turned out. Hopefully I’ll make it there soon and then try them at home. I might wait for you 🙂 But you never know! If I’m adventurous and try it, I’ll let you know. Clatite 🙂 ! Pofta buna! Crepes were great … the recipe was easy to bake and each and every CREPE was as the first one. But what I found out if you intend to use the CREPES for a stacked shell in a light but butiful cake you need to add 1/3 TSP Baking Soda. The baking soda ensures that there are no micro holes in the individual crepes, and each layer holds the filing per your taste …. I’ve never made a crepe cake before, been meaning to, so thanks for the tip, I’ll keep that in mind. This the same recipe my grandmother called “poor mans pancakes” or German pancakes. The only difference is we didn’t use butter. I grew up eating grandmas “poor mans pancakes” until I was old enough to identify this delicious meal as a crepe. I can remember my grandmother standing over the stove making these by the dozens for her 6 hungry grand children. We ate them with strawberry or grape jam/jelly, but I would always eat one plain with just powdered sugar. Great recipe and wonderful memories! First time making crepes. They were good and very easy. I made them for breakfast and will add a little more sugar next time. Thanks for this recipe. sounds good – but you should never use non-stick spray on non-stick pans. It actually ruins the finish. I learned the hard way when I had to throw out a couple of expensive non-stick pans. I adore crepes but have never made them. Your recipe is so easy. I must try these. Can you make them and freeze them and place them between Saran Wrap? My grandmother use to make us crepes. Since her passing, I’ve wanted them again so many times. I finally took the plunge and tried your recipe. YUM! A beginner cook such as myself can make this recipe. Tastes just like grandma’s. Thank you! My mom used to make crepes when I was young. Learned from my step dads family. We always used a very basic recipe. I still make them the same way. We cut up bacon into small pieces and fry some in the pan, then add the batter. Once cooked we put icing sugar in it and lemon juice then roll them up. Oh so good!!! The kids have always loved them and learned how to make them as well. My daughter had to make crepes for her Facts class (Of course at 10 pm) looked for a recipe and yours came up on Pinterest. We threw everything into the blender and then proceeded to make the crepes. This recipe if fool proof. She put Nutella and bananas inside topped with whip cream and proceeded to eat the whole thing. I always thought crepes were a “professional chef” kinda thing. But this recipe makes it so easy. I came across this recipe when I was craving clatite today. I have some beautiful just ripe peaches that will be perfect filling. However, I’m surprised and happy that your recipe doesn’t call for apa minerala. I was looking for a clatite recipe that does use apa minerala because I don’t keep it on hand here in the US. The recipe is very good but i can’t get it to flip properly, I made crepe salad instead of crepes. They are still very good. I loved this recipe. I was unable to get them as brown as you show but they were still delicious. I spread a little chocolate on them and then I filled them with cream cheese with a little powered sugar and lemon and fresh strawberries.l . They were a big hit! Everyone wanted the recipe! Thanks for helping me out with my pot luck group! My pleasure! You can brown them by letting them cook a few seconds longer. My mouth is watering just looking over this recipe. Your website is amazing. Keep posting 🙂 Multumesc mult! Your blog is making my mother SO proud of me. Thank you for posting your recipes! Adevarat a inviat! LOL!! Glad I could help. ? Thanks for the video! I’ve never made them before and that really helps me know what to expect, even as an experienced baker! My pleasure, do let me know how they turn out! 4. You can do the same recipe (same amount) with only one egg, so it’s less eggy. Hi Mary, I’m sure there are hundreds of different versions of making crepes. That’s what’s great about them, people make them different all over the world.